This image made from a home movie shows President John F. Kennedy and his wife, Jacqueline, moments before his assassination Nov. 22, 1963, in Dallas. Almost all Americans over 55 remember when they learned John F. Kennedy had been shot. And almost all Americans, regardless of age, know something about that moment 50 years ago, when everything seemed to change. But what about the minute before that — 12:29 p.m. CT, Nov. 22, 1963 — the one before everything changed? It’s a moment when Lyndon Johnson, once master of the Senate, has so little power as vice president that he can’t even get an ally appointed as a federal judge in Texas. Hillary Rodham is a teenage Republican, and Rick Perry is a young Democrat. In Congress, a federal income tax cut is opposed by … conservatives. No one is burning his draft card or her bra. If you’re going to San Francisco, you don’t wear flowers in your hair. International travelers still fly into New York’s Idlewild Airport. Space shots take place at the Cape Canaveral Launch Operations Center. The concert hall to be built on the bank of the Potomac River in Washington will be called the National Cultural Center. Eventually, some people will look back on the assassination as a portent, the point at which everything started to go wrong. For others — many of them JFK’s admirers — the future spinning out from this day will be emancipating and exhilarating. That future, for better and worse, includes war abroad against communism and a war on poverty at home; landmark civil rights legislation; Medicare and Medicaid; a youth counterculture with its own music, styles, drugs and ideas; movements for consumer protection, gay rights, historic preservation and Black Power; the sexual revolution; environmentalism and feminism; urban race riots and political assassinations. At 12:29 on Nov. 22, America is a nation of slightly more than 190 million people. California is about to pass New York as the most populous state, but the Census Bureau says it hasn’t yet. The richest nation in history is getting richer by the day. Despite recession worries at the beginning of the year, the economy has now expanded for 34 consecutive months, the longest peacetime expansion in history. America is minting millionaires at a rate of 5,000 a day. In four years, the poverty rate has dropped from 22.4% to 19%. New England is terrorized by what the newspapers call “the Boston Strangler.” So far there have been 10 victims; tomorrow, JoAnn Graff, 23, of Lawrence, Mass., will become No.11. Already this year, the first CVS drugstore has opened in Lowell, Mass. Coke has introduced its first diet cola, Tab, and Kodak has unveiled the Instamatic camera. The Beatles have released their first album, Please Please Me. Barbie has a new friend, Midge. Bob Dylan, a Greenwich Village folk singer, has a hit called Blowin’ in the Wind. It belongs to a new genre: the protest song. For the first time, front seat belts are standard on all new car models. The Mona Lisais on her first visit to America. In Hollywood, jockeying is fierce for an invitation to the Kennedys’ White House luncheon honoring the film industry. Hopeful stars save the date: Dec. 10. Today, 1,339 visitors have toured the White House. But President Kennedy is in Texas, flying from Fort Worth to Dallas. When Air Force One lands at Love Field, the Hertz clock atop the seven-story brick Texas School Book Depository building downtown reads 11:39. Kennedy is here to raise money for his re-election and to mend a split between liberals and conservatives in the state Democratic Party. He’s scheduled to speak today to local leaders at a luncheon at the Business and Trade Mart. His legislative initiatives — including civil rights, Medicare, anti-poverty measures and a tax cut — are blocked in Congress by a coalition of Republicans and conservative Southern Democrats. His challenge: how to break the impasse? The presidential motorcade leaves the airport. In 35 minutes, Kennedy will be delivered to his destiny in Dealey Plaza. The nation, unsuspecting, is along for the ride. It’s clear and 68 degrees — comfortable, unless, like Jacqueline Kennedy, you’re sitting in the sun wearing a wool suit. At one point, he tells his wife to take off her sunglasses; some people have come to see her face, not his. Newspapers across the nation have a wire service story about how the first lady, a notoriously reluctant campaigner, is enjoying her tour of Texas. Later, as front pages are frantically ripped up for special editions, the story will continue to run inside. After the motorcade turns onto Lemmon Drive, it comes upon a group of children with a homemade sign saying, “MR. PRESIDENT PLEASE STOP AND SHAKE OUR HANDS.” He does. At this moment, former vice president Richard Nixon is landing in New York after a flight from Dallas. Arizona Sen. Barry Goldwater, the likely Republican presidential nominee in 1964, is flying to Indiana for his mother-in-law’s funeral. In the absence of the vice president and the president pro-tem, Sen. Ted Kennedy of Massachusetts presides over the Senate. His wife, Joan, is having her hair done for their wedding anniversary party tonight at their home in Georgetown. Attorney General Robert Kennedy is sitting by his swimming pool at home in Virginia, having a working lunch with Manhattan U.S. Attorney Robert Morgenthau. Ted Sorensen, the president’s chief speechwriter, has just left a meeting in Washington with a newspaper executive who wanted to know whether Kennedy would replace Johnson on the ticket in 1964. Talk of the vice presidency reminds Sorsensen of something JFK told him: Every president elected in the 20-year cycle beginning in 1840 had died in office. At this point, America has not heard of Lee Harvey Oswald or Jack Ruby, or Sirhan Sirhan or James Earl Ray. There are no hippies, yippies or Trekkies, and very little gay pride. No one is wearing a miniskirt or an Afro. Malawi is still Nyasaland, and Zimbabwe is Southern Rhodesia. Muhammad Ali is still Cassius Clay. Leopard skin — some of it real — is a leading hat, coat and accessory fur. Campus excitement stems mostly from a seemingly endless variety of mindless stunts, such as a recent 30-hour touch football game played by two Cornell fraternities that ended in a score of 664 to 538. Immortals like Che Guevara, Gus Grissom, Janis Joplin, Otis Redding, Jim Morrison and Walt Disney are still alive, as is Jim Crow. The “V” sign still means victory, and the noun “happening” and the exclamation “Far out!” have yet to enter the vernacular. The best known acid is hydrochloric. Bob Dylan is still loyal to the acoustic guitar. Malcolm X is still loyal to Elijah Muhammad, founder of the Nation of Islam. In Bethel, N.Y., near Woodstock, Max Yasgur is running his dairy farm. In Alameda County, Calif., the Altamont Speedway will not open for three years. Hubert Gerold Brown is a young member of the Student Nonviolent Coordinating Committee; in later years, as H. Rap Brown, he will be known as the antithesis of non-violence. Gen. William Westmoreland is an airborne corps commander at Fort Bragg in North Carolina. Gen. Creighton Abrams is attending a military ball at the old Nazi casino that now serves as the officers club at the Army command headquarters in Frankfurt, West Germany. Timothy Leary, dismissed this spring from his teaching job at Harvard, has turned on, tuned in and dropped out. He’s living on an estate north of New York City and continuing his experiments with hallucinogenic drugs. Angela Davis is in her junior year at Brandeis, where she has met the philosopher Herbert Marcuse, who will sell her on the need for revolutionary social change; she has already had her first interview with the FBI, following her return to the USA from a leftist youth festival in Helsinki. An inexperienced young guitarist named Jimi Hendrix has formed a band in Tennessee with Billy Cox, a bassist he met in the Army. The manager of The Beatles is about to convince an influential American disc jockey to play their records; soon, some stations will play little else. Paul Simon and Art Garfunkel, who have failed to become stars since recording their first single in 1957 as Tom and Jerry, have an audition early next year with Columbia Records. The motorcade approaches the route’s biggest crowd. For 12 blocks, people have lined up eight or nine deep on the sidewalk, while others lean out of office windows above. The future is hard to see, but it’s coming. John Kerry, a sophomore at Yale, is five years from piloting a Swift Boat in South Vietnam. John McCain, already a Navy pilot, is four years from being shot down over North Vietnam. Ralph Nader, who has been teaching government at the University of Hartford, is headed to Washington. There he will publish Unsafe at Any Speed, his indictment of the auto industry. Eldridge Cleaver is in Folsom Prison, six years into a sentence for assault with intent to murder in connection with a series of rapes. He has begun to write essays that will become the basis for his memoir Soul on Ice. Dennis Hopper, who appeared with James Dean in Rebel without a Cause, is blacklisted in Hollywood for his insolent attitude. It will be two years until he appears in another major picture, and another four until his directorial debut, Easy Rider. Charles Manson, who turned 29 10 days ago, has spent half his life in prisons and other institutions. He’s now serving a federal sentence on McNeil Island in Washington State, where he’s taking guitar lessons in hopes of furthering his musical career upon his release in 1967. A building on Christopher Street in Greenwich Village, constructed in the mid-19th century as a stable, has housed a restaurant for three decades. In a few years, it will be gutted by fire and reopen as a gay bar called The Stonewall Inn. For a block, the motorcade heads directly toward the Book Depository. Then it makes a wide left and moves through Dealey Plaza, heading downhill toward an underpass and the safety of the highway beyond. By now, across the land, those with roles in the great tragedy about to begin have taken their places. Years later, they will remember and recount. In Uniondale, N.Y., junior Robert Castagna, at a blackboard at St. Pius X Prep, examines a math problem. In Riverside, Calif., Marie Freeman is at the pediatrician’s office with her 2-year-old son, who is wheezing and gasping for breath. In Levittown, Pa., Renee Bush is celebrating her fifth birthday in kindergarten class. The cupcakes have just been passed out. In New York City, Stephen Baldwin, 7, is descending in an elevator with his mother. 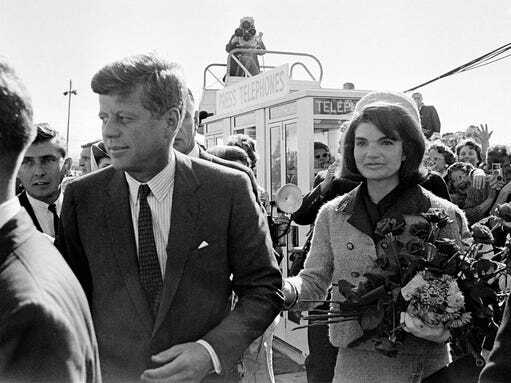 In Dallas, Jacqueline Kennedy is wilting in her pink wool suit. She sees the underpass ahead and thinks, she’ll later say, how nice the shade will feel. But she, like most Americans this day, has no idea what really lies ahead. The Hertz clock on the Book Depository says 12:30. Some minutes later, the principal of Pius X comes on the intercom. The doctor who’s just examined Marie Freeman’s son opens the door to his office, walks into the waiting room and stands there, apparently trying to say something. Renee Bush’s party is interrupted. Her teacher is crying, and the cupcakes are taken away.